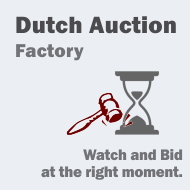 Dutch Auction Factory is a Joomla! extension that allows to create and maintain an auction based website where the prices are lowered over time (decrements) until a bidder is accepting the offer. A real time graphical tracker informs users about the state of the price, showing them the amount of time left until the next price decrement. You can test Dutch Auction Factory by clicking the menu on the left, and check out the administrative backend by clicking on the menu on top. Having a fully customizable template system, webmasters even without any PHP knowledge can easily modify the look of any page in our extension. There is no need for the webmaster to change the extension's code, and this will ensure a 100% upward compatibility with our future releases. Just back up the template folder and all of your customizations will be safe. The Auctions Factory Package includes ALL PHP sources (nothing encrypted) and one set of generic templates (commented in the files - for a better understanding) along with a full documentation of the template system (available under documentation in our website). When setting an auction a user has the ability to set a starting price and a minimum one, and also the amount of the decrement and it's occurrence. With a fully customizable mailing system you can ensure that users are notified regarding their activities. You can enable or disable any notification and change its contents. Using the ACL (access control list) feature you can restrict some usergroups or specific users the right to post auctions or to place bets. For instance, this way you will be able to create admin-only auction websites or charge users for specific group memberships. For payments towards the site (on listing items, featured items, etc.) there are already some Payment gateways available out of the box such as Paypal, but using the published API under our Documentation section, any payment gateway can then be further added.